We are open Monday to Saturday throughout the year, including spring and summer bank holidays. 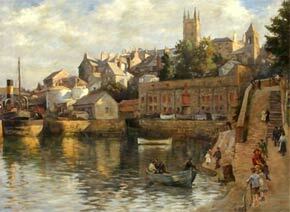 A changing programme of exhibitions focuses on the unique historic art of west Cornwall, including the world-famous Newlyn School artists. PLEASE NOTE that we are partially or fully closed between exhibitions: please see 'What's On: Exhibtions' for further details. 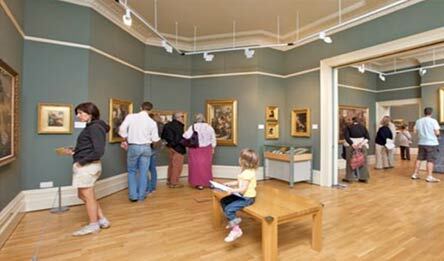 The Friends, a registered charity, provide voluntary help in the Gallery and raise funds to support our work. Benefits include free admission, shop discount, invitations to previews and a winter lecture programme: please ask for a membership form. Tours and group visits are warmly welcomed: a free introductory talk is provided on request and a full guided tour can usually be arranged for an additional charge, but prior booking is essential for all groups and the maximum group size is 25. We have a regular programme of children's holiday and half-term workshops, often based on our exhibitions and offering the chance to experience new ideas and to experiment with unfamiliar materials. For details, please visit our website or ask to be put onto our children's workshop mailing list. We have a variety of activities for schools, ranging from object-handling sessions to art and history workshops, plus teachers' packs providing ideas and information for use in the Gallery and classroom. School visits are free, but must be pre-booked, and teachers are asked to contact us in advance to discuss their requirements. If you would like further information about a specific object, artist or painting, or would like to see an item in our reserve collections, please contact us. 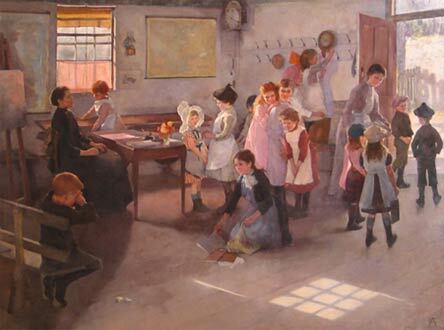 Penlee House, Penzance, is the only Cornish public gallery specialising in the Newlyn School artists (c.1880 - c.1940) including Stanhope and Elizabeth Forbes, Walter Langley, Harold Harvey and Laura Knight. Set in an elegant Victorian house and park, Penlee House also covers West Cornwall's archaeology and social history, and offers an excellent café and shop. Cornwall Tourism Awards as the best small visitor attraction. Built in 1865 as a gracious Victorian home, Penlee House has been converted to create a first class gallery and museum set within an attractive park. 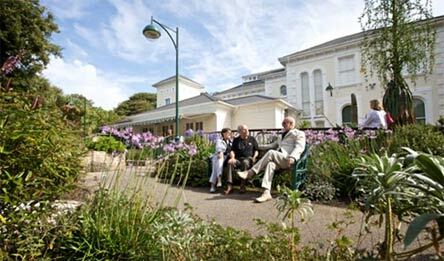 Penlee House specialises in showing the area's unique, rich cultural heritage incorporating the historic collections of Penzance Town Council, Newlyn Art Gallery and the former Penwith District Council. For more information and to search our collections, visit www.penleehouse.org.uk. 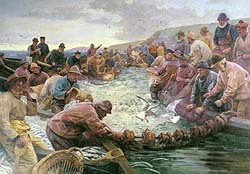 A programme of changing exhibitions celebrates the skill and craftsmanship of painting in West Cornwall in the late 19th and early 20th centuries, usually including the world famous 'Newlyn School' and Lamorna Group artists, such as Stanhope and Elizabeth Forbes, Walter Langley and Lamorna Birch. 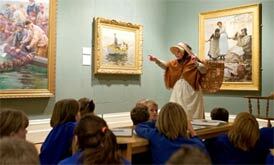 Penlee House has a permanent collection of paintings which is actively being developed. 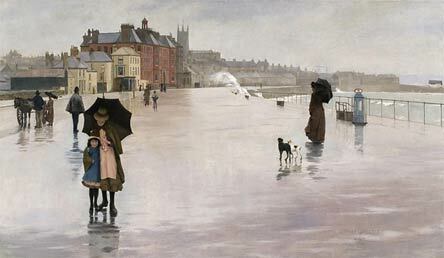 Some of the best-known works include The Rain it Raineth Every Day by Norman Garstin, School is Out by Elizabeth Forbes, Among the Missing by Walter Langley and On Paul Hill by Stanhope Forbes. Please note that although each exhibition includes selected works from our collection, there is no permanent display and key works are sometimes out on loan to other Galleries: please check what is on show before making a special journey. Founded in 1839, the museum collections cover 6000 years of history in west Cornwall, from Penwith's awe-inspiring archaeological sites to the area's more recent social history. Recently refurbished, the museum displays reflect the unique and fascinating history of the area, including key figures such as Humphry Davy and the local fishing, farming, mining and tourism industries. Our delightful licensed café, with its sun-bathed terrace overlooking the park, offers a range of coffees, afternoon tea with home baked cakes and freshly prepared light lunches, using the best of local produce. For enquiries, please contact the café direct on 01736 361325. Our well-stocked shop offers a wide range of prints, books, gifts and souvenirs. A mail-order service is available. 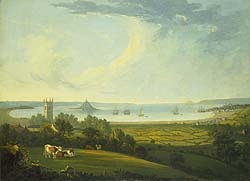 For more information and to search our collections, visit www.penleehouse.org.uk.